Mark your calendars and brace yourselves for the very first Toronto Ski Hawks Dining in the Dark Fundraiser at O'Noir Restaurant! At O'Noir, located a quick walk away from Yonge and Bloor, you are escorted into a completely dark room by a blind or low vision server, for a thrilling, three-course dining in the dark experience. Come dine with us on Sunday April 7th 2019 at 6:30 pm. Have you ever thought of becoming a guide? The Toronto Ski Hawks are always looking for volunteers, especially guides. We ski for 9 weeks in the winter at some of Ontario's finest private/semi-private ski clubs. An essential part of skiing for the blind and visually impaired is having qualified guides. If you are an intermediate or advanced skier we will train you how to enrich the experience for our skiers and get them safely down the hill. Our guide training classes start the first week in January every year. Simply complete our contact form and select "I would like to become a guide" and we will contact you. Back in 1969, a small group of blind people were invited, through the C.N.I.B., to try alpine skiing together with some recreational students from Centennial College. The experiment was so successful that after the ski season, they formed their own club. Named The Ski Hawks, it was the first such club for blind skiers in Canada. Through the efforts of the ski school directors, The Ski Hawks have had the privilege of being invited as guests to several private and semi-private clubs in Ontario. These clubs have added great dimensions to the ski program by providing an exciting variety of ski slopes and excellent facilities for our use. The Ski Hawks would like to use this opportunity to thank these clubs for their support. A vital and necessary ingredient is the dedicated and knowledgeable volunteer ski school. They provide safe ski instruction and guiding by qualified ski instructors and ski guides. The ski school offers instructional training along with a full day skiing on Saturdays. The Toronto Ski Hawks welcome the visually impaired and blind to come and join us. If you have never been skiing we will teach you; if you have skied we will guide you. Saturdays we head off to ski-country for a full day of skiing at some of Ontario's finest private/semi private ski clubs. If you would like to volunteer as a guide, and are a good intermediate skier, the Hawks Ski School will give you the required training. 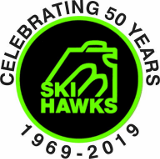 The success of The Ski Hawks has been due to the great interest among the blind and visually impaired in outdoor winter recreational sports and the resulting companionship of others sharing this enjoyment of skiing. To get more information please complete our contact us form.